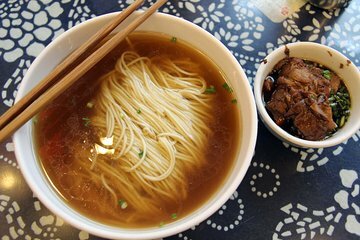 Dive deep into Shanghai's culture during this 3-hour food tour. Stroll through the off-the-beaten-path areas of the city to taste local favorite dishes during eight tastings. Visit street vendors and traditional restaurants to taste dishes such as frog stir-fry, crab shell pastry and 'sheng jian bao' (pan-fried dumplings). Learn about the fast-paced Chinese city's culinary history and culture through your guide's informative commentary. All tastings included. 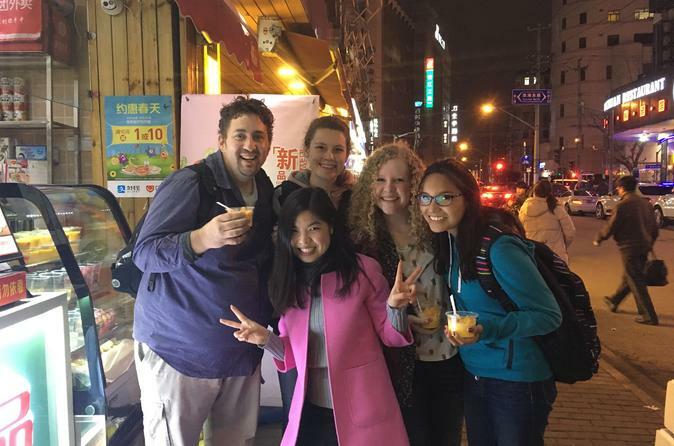 Meet up with your tour guide and group of fellow food-lovers near People's Square to embark on your 3-hour food walking tour. Set off through the back streets of Old Shanghai, learning about the culinary culture and history of the bustling city as you stroll. Stop at traditional restaurants and street vendors alike over the course of eight tastings. Pass some of the last remaining collective housing, or shikumen, in the city and see where vendors from the Gansu and Xinjiang provinces sell their traditional foods. • Popular Shanghainese dessertsAll tastings are included, and add up to a full meal. Had a great time walking around in the rain with Sisly. She was friendly and informative and we experienced a wide range of traditional food that we probably would not have chosen by ourselves. We had a great time. This is the second time I have done the Old Shanghai Food and Walking Tour. In terms of experience and value for your dollar, this tour is second to none. Our wonderful guide Lily was absolutely delightful and we had a blast with her. At first you may think that you will not get full from the samples be ing provided but trust me, you will be full by the end after stopping at 10 locations for authentic Shanghinese cuisine. 10/10 rating for sure! Our guide spoke excellent English and knew many things about local food history and how these were cooked. She is jolly and kept the tour interesting and happy at all times. She made sure we were having fun and eating a lot. Places we would not have usually gone to. Interesting food - my husband had a ball! This tour involves about three hours of walking and LOTS of food! Lily was a great tour guide - enthusiastic, happy, cheerful and had a good command of English. There was almost too much food and perhaps a bit too long for crowded street walking. It was great to try new restaurants we didn't know about in Shanghai, but it was a little frustrating that we had to wait for a while and fight over seating at every place we visited. Our guide was also not the easiest to understand in English. I'd recommend this tour for first timers to Shanghai. We very much enjoyed our walking tour of the Jewish ghetto in Shanghai China. Mason, our tour guide was very personable and informative about the history of the ghetto and the wave of Jewish people coming to shanghai during the early 1900's and again 1930-1940. We also toured a house in the ghetto. Our guide Sisly was amazing her English was perfect and her knowledge of the China and its food traditions was outstanding! We thoroughly enjoyed it as it wrapped up our last night in China after a 12 day holiday. Highly recommend this tour and ask for Sisly She is WONDERFUL ! Excellent tour with 9 stops sampling local foods and drinks - Great way to learn about Chinese cuisine, culture and local sights. Tour guide had excellent English, and was very friendly and engaging. Would highly recommend this tour - Best tour that we did on our 2-week holiday in China. This was an excellent tour and really provided an insight into the lives and experiences of local Shanghainese. The background on each of the stops was fantastic and we were well and truly satiated by the end. I would HIGHLY recommend this tour to anyone even remotely interested in food and local culture. Oh, and Elaine was AMAZING! SHE IS AWESOME! Reason enough to take the tour.